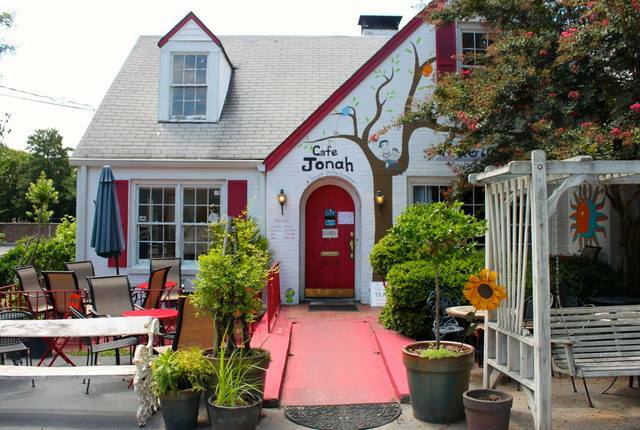 Cafe Jonah and The Magical Attic will close at the end of February, 2016. The restaurant opened five years ago, replacing Full Cup, which relocated nearby but closed permanently this past August leaving many customers disappointed. Cafe Jonah serves a variety of breakfast, lunch and weekend brunch creations as well as assorted juices and coffees. "The Magical Attic" upstairs was used for special events as well as psychic readings. Property records indicate the Cafe Jonah property sits on roughly a third of an acre and that the building is about 3,800 square feet, originally constructed in 1940. Although the exact plans for the property are not public, the lease not being renewed hints at a redevelopment being planned. The limited parking on site has consistently been a challenge for Cafe Jonah, leading me to believe that a land assemblage may be in the works to create a larger parcel with more options. Owner Jenny Levison sent out an email to customers earlier this evening explaining the closure. "It is with a very sad heart that I must tell you that Cafe Jonah And The Magical Attic will be closing at the end of February, 2016. Our landlord is not renewing our lease and intends to sell the property. I have been searching for the past year for a comparable space that we could call home, but have not found anything that holds the special quality that we have had here. I opened Cafe Jonah five years ago as an ode to my Son, Jonah. It was to be a place where the community could come together over a great cup of coffee, delicious food and to explore our upstairs attic space which hosted my interest in the metaphysical. From the beginning, my mission was to donate a percentage of our profits to local Atlanta organizations that needed our help and I am proud of our five years of success. In the coming weeks, I hope you will stop by the Cafe, visit Sue in the kitchen and thank her for her delicious cooking. If you are a client of Sheila’s in the attic, head upstairs and hear about how you can find her and what the future holds." Given the funky-ness and uniqueness of the current space, it's understandable that Levison is having such difficulty finding a new location. Buckhead Village, if you can call it that anymore, is quickly losing all the cool shops and restaurants that have made it a destination for so many. Planet Jenny, the umbrella company over all of Levison's businesses, has grown steadily over the past few years. What started as a single location of Souper Jenny in Buckhead has since grown to a total of four locations in Brookhaven, Decatur, Westside. The company also includes Juicy Jenny adjacent to the original Souper Jenny, as well as Cafe Jonah. Plans call for Souper Jenny and Juicy Jenny to close March 26, 2016, and to reopen as a single operation in the newly renovated Atlanta History Center. When the relocation was announced, Levison indicated she planned to have the new location open April 2nd, 2016. Where would you like to see Cafe Jonah reopen? What is your favorite item on the menu at Cafe Jonah? What is your favorite Buckhead Village business? time for her to move to the old Mezza location! Stop all the building in Buckhead! What was the place that had the Ferris wheel? Animal Crackers? I think this place would do well down in Highlands / Inman / O4W / Candler Park / Lake Claire areas. Hopefully she can get it back running somewhere else in town. Vinings Jubilee. Both Noche and Social Vinings have closed so we have room. while I live worked and owned a business in Buckhead I feel it has lost all its charm. I left the states for 11 years almost but as I'm planning a return I've been spending time in Atlanta again in the last couple of years. Buckhead is a place I wouldn't open a business again. I was her neighbor but like the article said there are few cool places left in Buckhead.